Nigel (Avening, United Kingdom) on 5 June 2012 in People & Portrait and Portfolio. This is lovely b&w. She is practical, why not forks and knifes also, to have everything with her?! Quel portrait et iamge usperbe cette dame avec sa belle couromnne charmante. A rather unusual hairstyle, not easy to stir the tea :) Good day. Une nouvelle tête couronnée! La reine d'Angleterre a des soucis à se faire! I don't know if I would wear this... ;) But it's a great portrait ! Have a lovely day Nigel. That is one unique way of recycling antique silverware..great shot. Good idea. She obviously hates those plastic ones you get these days. She seems happy with her solution as well. A clever idea for a tiara - and so economical. Does it pick up BBC1? Excellent find and shot! Ha - that is a really great find. What an ingenius lady and a great portrait! A whacky hairstyle but a really good portrait.. I think Lizzy would have liked that one..! This is cute but it is also a great rgeat shot, Nigel! Beautifully done sir! Teaspoons???? This must be ST! A beautiful portrait with that warm smile and I love how the heart earring stands out in this B&W compo. That headpiece makes her look a bit like a turkey. Cool shot. 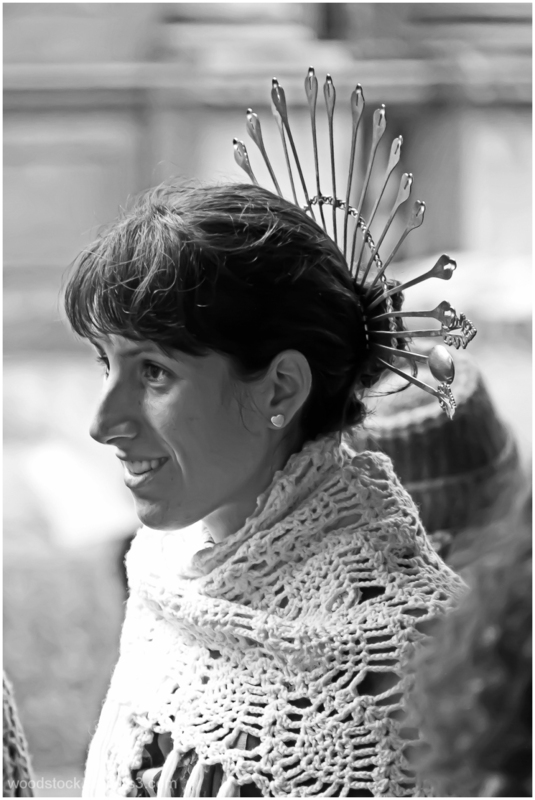 Very lovely portrait, delicately knitted shaw and love the teaspoons ~ that's really creative! so that's what happens to the spoons in work! Beautiful portrait! What a creative idea! Wow.. great idea never thought about !! haha, resourceful hair accessories! Great portrait! Well I've heard of hairpins......but? it's jsut what I thought when I saw the picture ! fantastic portrait in every respect !